Spiral CFLs are less prone to breaking than traditional bulbs, and they’re naturally more energy-efficient due to their design. Whether it’s for facility hallway lighting or individual overhead, a spiral CFL is an affordable, reliable choice. Shop with Cors Lighting for spiral CFL light bulbs and save with free shipping on orders of $99 or more. 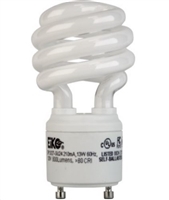 Be sure to call us at 217-806-0502 if you have any questions or concerns about fit and application of our spiral CFLs. ***Not for use with dimmers, electronic timers, photocells, or motion/occupancy sensors.